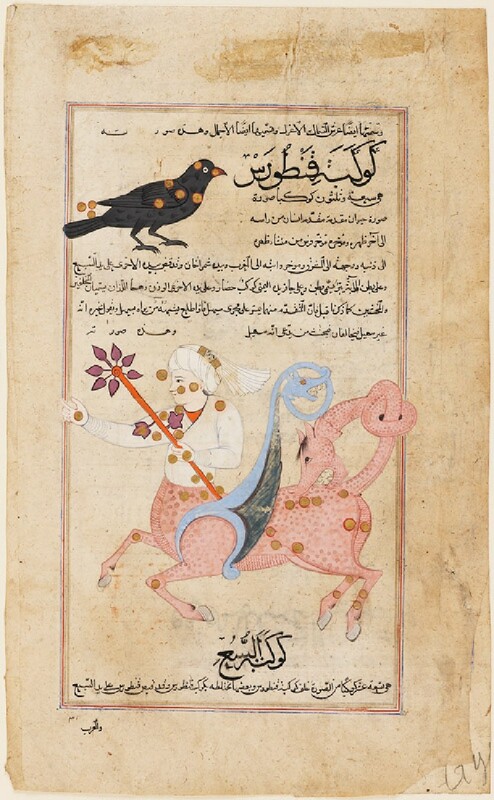 These illustrated pages [EA1978.2573, EA1978.2576, EA1978.2577] originally belonged to three different manuscripts of The Wonders of Creation and the Oddities of Existence (Arabic: ‘Aja’ib al-makhluqat wa-ghara’ib al-mawjudat), a treatise on the marvels of the universe written by cosmographer and geographer Zakariya ibn Muhammad al-Qazwini (1203–1283). Widely copied and illustrated across the Islamic world, The Wonders of Creation consists of two main parts. The first part deals with the heavenly spheres, and discusses angels, constellations, planets, and different calendars. The second part, devoted to the earthly realm, describes the four elements, minerals, plants, living beings – including humans – spirits, and extraordinary creatures such as giants. The style of the first folio depicting the angel Ruh suggests that it was produced in western Iran during the second half of the 1500s. 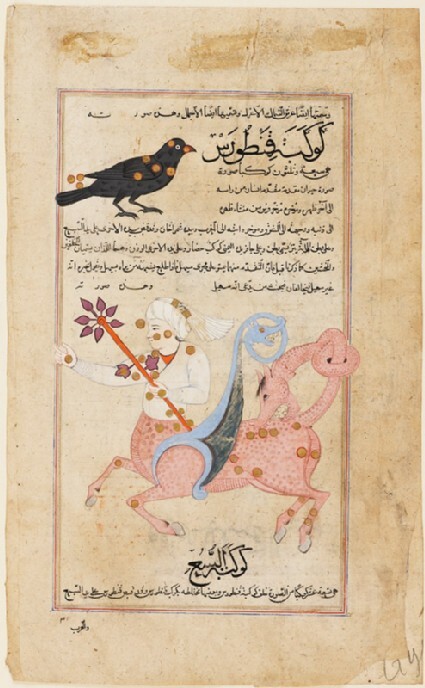 The second and third folio of constellations and giants belong to two separate, but closely related, manuscripts from a different painting tradition, and were possibly made in the Deccan (central India) at the end of the 1500s or early 1600s.